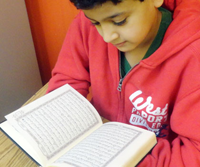 The MAS DFW Qur’an Institute provides a variety of courses to support the proper recitation, understanding and memorization of the Holy Qur’an. Our distinguished program engages the students with personal and spiritual development that puts them on the track to become a better citizen. The program also integrates Islamic aqeeda, values and etiquette.